Time for a new review, gang. This time we're checking out the perplexing Kingdom Hearts 358/2 Days. It has a weird title until you find out what it means, but how is the game? Let's check it out with this review. 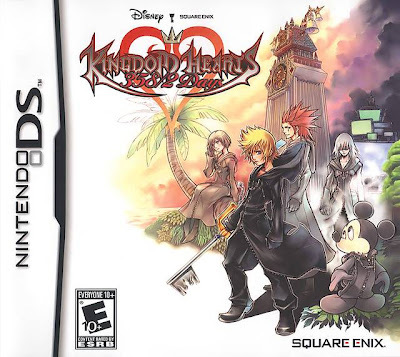 Continuing its quest to hit every platform known to man, the Kingdom Hearts series is now marching triumphantly onto the Nintendo DS with an interesting and awkwardly-titled, Kingdom Hearts 358/2 Days. Is this game a full-fledged hero or just another heartless Nobody? You play as Roxas, a human-like being known as Nobody. Nobodies lack a vital part of being human-- a heart. Which goes to wonder how Roxas and the other Nobodies have any emotion at all. 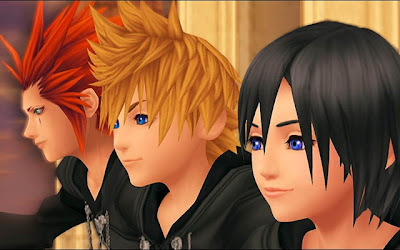 Regardless, our young hero joins up with Organization XIII, a black-robe donning group wanting to revitalize Kingdom Hearts for the stated purpose of receiving hearts for every member. Could there be some ulterior motive for this plan, however? 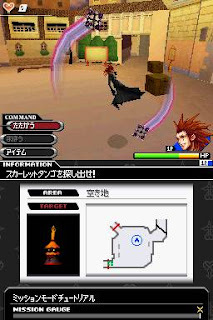 Kingdom Hearts on the DS shows Roxas yearlong escapades with the Organization, leading up to the events of Kingdom Hearts II. Most of the game is told through text cut-scenes, but occasionally a CG sequence, especially in the beginning and end of the game, are thrown in for good measure. These scenes may just tug at your heartstrings which can't be said for a lot of handheld games, especially DS game, out there. Kingdom Hearts 358/2 Days doesn't have you actually playing all 358 days of Roxas' tenure at Organization XIII. Instead, the game constantly skips and fast-forwards through the days. Each day starts with either a cutscene or a new entry popping up in Roxas' diary. 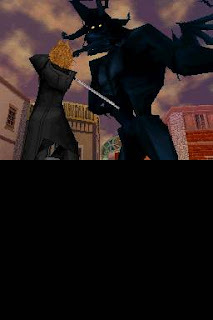 Then you go see Saix, second-in-command in Organization XIII to see the day's available missions. The mandatory ones are indicated by having a keyblade next to them. These must be completed to progress the story while there's a ton of optional missions to earn new gear and items. In total, there's around one-hundred individual missions to complete. Not only that, but these story missions can be completed in the game's mission mode where up to four players can play ad-hoc with the Nintendo DS' wireless connectivity. This is where old friends like Riku, Donald, Goofy, and even the master mouse himself, Mickey, are available to select from. The missions themselves fall into two categories-- reconnaissance and hunting for heartless. Reconnaissance has you investigating and examining various portions of the game's many worlds. None of these are particularly new to the franchise, and many veterans of past Kingdom Hearts will feel a sense of deja vu re-exploring them. 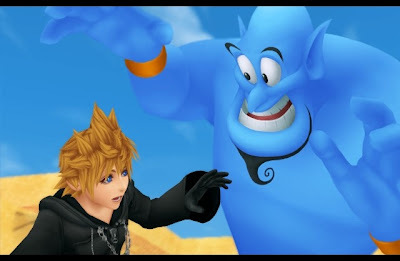 Roxas will be sometimes be joined by a partner in two in order to explore these new worlds ranging from Never Land to Wonderland to Agrabah. The goal of reconnaissance missions is to gather enough clues to land a breakthrough in the investigation. The other type of mission, hunting heartless, is what it sounds. There's a variety of mission types here such as collecting hearts from said heartless (a conundrum all to itself) and eliminating a set target or targets. 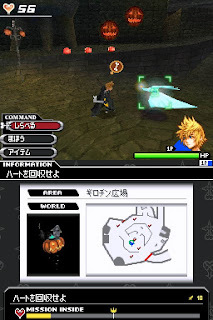 Roxas is equipped with all sorts of tools, and as missions are completed he earns new items and gear. In Kingdom Hearts 358/2 Days, gathering new abilities and bonuses revolves around a panel system where players equip icons to said panels unlocking new abilities. This is also how levels are gained by equipping level icons to the panel. However, there's only so much room on a given panel, so players must be cautious and strategic in what they place as not to waste any space. 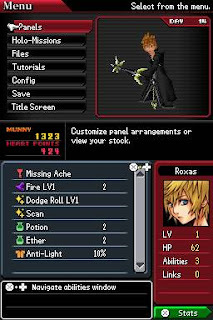 Gear panels can be equipped with special icons to boost attack and defense while Roxas' equipment is dependent on what is placed on a given panel such as items and magic. It's an interesting take on the stat-tracking that RPGs are known for, and it works well in this case. The majority of your time in the worlds of Kingdom Hearts 358/2 Days will be spent between exploring, collecting treasure chests and investigating areas, and battling. Combat should be familiar to any Kingdom Hearts veteran, and it's simple enough for newcomers not to be overwhelmed. One button jumps, one button blocks, and one button attacks. Tapping on the attack button with a good rhythm enables combo attacks to be unleashed on enemies. The camera can be mapped to the shoulder buttons or just assigned to the right shoulder button for ease and to open up the left shoulder button for item and spell shortcuts. The X button cycles between attacking, items, and magic as there's no analog stick on the DS obviously. This takes getting used to, but again after perseverance, it becomes second nature. Locking until enemies is done by double tapping the R button. Unfortunately, many times the game will lock onto the closest enemy in reach instead of the one you actually wish to attack. Furthermore, forget the heartless as the camera can be quite a nuisance itself! It constantly spazzes (my technical term for it) out in heated confrontation leading for some frustrating moments. Thankfully, the combat isn't so complex that it needs a dedicated camera. Kingdom Hearts 358/2 Days is a mightily impressive looking and sounding game. The CG cutscenes are gorgeous to look at really showing that Square-Enix knows how to get the most out of any hardware. Meanwhile, the in-game characters and backgrounds are rather detailed, too. However, there's a lot of jagged edges to be found, ones that could cut through a brick in seconds. That said, it's still very astonishing the level of graphical detail and prowess this game has. On the music side of things, many tracks are remixed versions ripped straight from Kingdom Hearts 2. There's very little in the way of all-new music to be heard which is okay since what we already have is high-quality stuff. Overall, the presentation of Kingdom Hearts for DS is simply sensational. Overall, Kingdom Hearts 358/2 Days is a competent action-RPG that does enough to differentiate itself from its older, bigger brothers. The two modes, story and mission, allow for near limitless replay value with friends, and the story is one that you'll want to stick with up until the very end. There's enough variety to keep players interested, the presentation is terrific, and the action is fast and frenzied. For a game all about heartless, this game has got a lot of heart.